Mind you, it is not just the sound of the fortepiano. The case for playing the keyboard music of Haydn, Mozart, Beethoven and their contemporaries on the fortepiano rather than on the modern grand, will always be that this is the sound for which they composed, that they had in their mind and ears when they wrote these sonatas, and that playing them on the modern grand is a transcription of these composers’ intentions, rather than an attempt at realizing these intentions. I was very interested by the fortepiano when I started listening to classical music… a few decades ago. There was something to be learned (I thought) about the compositions and their performance practice by hearing them in their original guise. But then, the case for playing the keyboard music of these composers on the modern grand is, simply, that it sounds better. Granted, this is a subjective notion. What sounds better for me will not sound “better” to someone else, and I will not dispute the preference of those who prefer their Haydn-Mozart-Beethoven… or Voříšek on the fortepiano, or their Bach on the harpsichord. 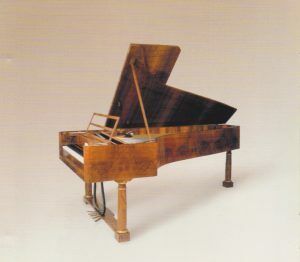 But familiarity with the fortepiano makes clear that, despite their sweetness of tone, even the best (well-preserved originals or copies) sound like your imagination of Schoeder’s toy piano: somewhat wooden and dry, short on resonance and harmonic overtones, especially in the treble register. The modern grand sounds, yes, grander, fuller, more imposing, and, despite the fortepiano’s unique timbral color, conveying a greater variety of colors. While the fortepiano can bring a lot of atmosphere in smaller fare and more lightweight pieces, like Beethoven’s Bagatelles or Schubert’s Ländler, they are simply no match to the modern grand for conveying the turbulence and passions of “Sturm-und-Drang” music of the late 18th century or romantic music of early 19th. This may all sound more dismissive than I really am. I still find it interesting to hear music of that era played on the fortepiano. Yes, for “interest”, for musicology, for trying to immerse oneself in imagination in the sound world of the era, the fortepiano is fine. For pieces as often recorded as the piano sonatas of Haydn, Mozart of Beethoven, with the serious amateur likely to have multiple versions on his shelves, it is good to have at least one played on the fortepiano, for reference, for remembering, once in a while, how it might have sounded to the contemporary audiences. For music and emotion, it is the modern piano. And returning, once in a while, to the fortepiano, is always an occasion to marvel that the contemporary audiences were able to recognize the genius of Mozart-Haydn-Beethoven, when they couldn’t hear it, really, in its full deployment. So, to a newcomer to the piano music of those composers, I certainly wouldn’t recommend a recording on the fortepiano as a first choice and introduction. 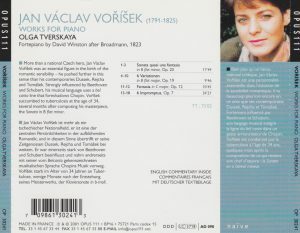 Likewise, given the rarity of Voříšek’s piano music and considering that is not likely to be familiar to the immense majority of listeners, I wouldn’t recommend this recording by Olga Tverskaya as a first choice to anyone. It is fine music, evocative of early Beethoven or Schubert (and with Schubert Voříšek further shares an untimely, early death, at the age of 34), and it is even above that in the Fantasy op. 12, a genuine masterpiece, one that dispels any temptation at conjuring reminiscences of other composers. But you won’t know that listening to this recording. And, as announced above, it is not just the instrument. I was sent back to this CD, which I had had in my collection since I don’t remember when, from listening to Artur Pizarro‘s recording of the same program on Collins Classics 14582 (1995). Tverskaya’s tempo in the Fantasy’s first section is perhaps closer to the “Andante” written by Vorísek . Pizarro is a true adagio. But sometimes the interpreter is right to go against the composer’s indication. Not only does Pizarro’s slower tempo enable him to observe much better Vorísek ‘s articulation marks, dynamics… and silences. But it makes you believe that you are hearing a rare masterpiece. Tverskaya sounds indifferent, just spinning notes, and manages to turn it into an indifferent composition (and truth is, it didn’t leave much of an imprint in my memory). Then comes the allegro and agitated section, and there she is limp, un-agitated, turning it almost into pretty and gallant salon music where it should be (and is with Pizarro) passionate and turbulent like the finale of Beethoven’s Moonlight Sonata or a Schubert Impromptu. And I’ll skip the finer details, the spots where the right hand covers the left hand (no, the fortepiano doesn’t even have the advantage of greater clarity, at least not here), trills played not as trills. The Piano Sonata fares a little better interpretively (not in the finale, though, marred by the same kind of stateliness and lack of drive and enthusiasm as in the Fantasy), and this is a case where this recording could provide a welcome complement to any version on modern piano, giving you an idea of how it might have originally sounded: smaller, more intimate maybe, for the salon rather than for the concert hall. But it seems to me that the writing of Voříšek (like Beethoven’s, like Schubert’s) has a power and an approach to dynamics, that calls for the concert hall rather than the salon. The impact is with the modern piano. In the impromptus, I don’t know what should be attributed to the instrument’s lack of responsiveness or to the player’s lack of imagination, but Tverskaya misses the sweet, nostalgic, Schubert-like (and almost pre-Schumann) colors that Pizarro brings to No. 1 and makes it sound just perfunctory. Her tempo is so laden and soporific in No. 2 and No. 5 that she makes them charmless and boring, where Pizarro imbues them with a skittish charm. In No. 4 & 6 I’d blame rather the instrument, because Tverskaya’s tempos are fine and she does bring out as much as the instrument allows the agitated, Schubert-like right-hand triplets in No. 4, and the little grace-note in 6 is just fine. The use of what I suppose is the damper pedal at 2:24 for the middle section of No. 6 even allows for an incomparable change of color. But the instrument’s lack of harmonics in the treble rapidly makes the characteristic, little chromatic theme in anarcrusis which opens No. 4 and returns regularly, very obnoxious, and for the same reason (less chiming treble), with Tverskaya the wonderful little music-box passage at 2:27 doesn’t approach the poetic evocation of childhood that Pizarro makes it. Likewise, the hazy and dreamy harmonies of fifths that open No. 6 with Pizarro aren’t as evocative with Tverskaya. Only in the little variations op. 19 do I find that Tverskaya and her instrument have, in some sections, a lead over Pizarro. Here, because of the lightweight nature of the composition itself, the instrument is well-suited, Tverskaya uses to the best its delicate treble (try Variation 2, track 6), her basic tempo, swifter than Pizarro, is best suited to Vorísek ‘s inconspicuous little theme. But again, her 5th variation, a Sicilienne, could have been less ponderous and more airy, and her allegretto tempo in the finale (rather than the allegro indicated by Vorísek and played by Pizarro) turns it into an inconspicuous salon piece rather than one of Haydnesque verve. Ultimately, then, Tverskaya doesn’t give Vorísek a fair chance – which, in the case of such a forgotten figure, is tantamount to killing him a second time. No wonder the disc failed to make an impact when I heard it back then. I had to hear Pizarro to realize the many beauties contained in Voříšek’s piano music. I hate to be entirely disparaging with a CD, because there is, I feel, always a positive side to any recording. Trying here to be positive, what would be, then, reasons to buy this disc? 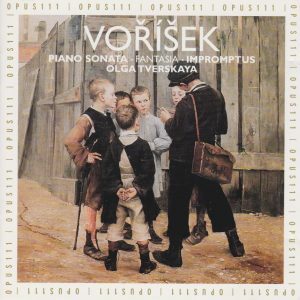 If you desperately want to hear how Voříšek would sound played on the fortepiano… if you are a friend of Tverskaya… if you want to support small French labels (but here you’d be too late: Opus 111 is now defunct anyway)… I’m getting rid of mine, and making shelf space. Or if you collect CDs with a TT of over 77 minutes.